Discussion in 'Buyers House' started by Crystal Hikara, Mar 22, 2008. 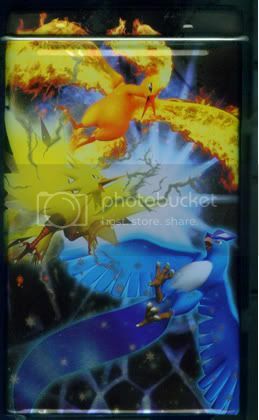 I recently just received an oldish deckbox with the three original legendary birds on it, Articuno, Zapdos, and Moltres. Now, I went to States, and I do believe I spied someone playing a deck that had the matching sleeves. I was wondering if anyone had them in stock, as well as their prices. The decksleeve image I'm talking about is this. Looking for a pack, opened or not, of 60. If opened, I wish to see some pictures first. Only have Paypal, too, as a note. Edit- got what I needed. Thank you, Kemony, for linking me up. PLEASE LOCK. Let me know how much you are willing to offer for them. I have both the Tin and sleeves, actually I have about 120 sleeves, make your offer. At the least, $4 for a pack of 60. At the most, $8 for 60. Willing to negotiage, I guess. I'm not entirely sure of their worth, given there isn't a high demand for them to my knowledge. Now, you do know these sleeves aren't legal for tournament play, correct? Because the borders are not solid, they can be marked easily. It's possible that these accidently passed deck check. Just thought maybe you'd want to know before buying them! if you play in league alot, these sleeves are still acceptable for league play. Yeah, I'd still want them for league and the like, really. I have my tourney sleeves. I was just saying that I caught sight of them there and the like. Trust me, I still have an unlimited deck that needs sleeving badly.